What I’ve seen while visiting local churches has prompted some wrestling with God over the way we receive – or don’t receive — offerings during our worship services. Gone are the days when we gave by passing the plate or basket across pews filled with worshippers who come every week. Today’s giving opportunities and strategies, while convenient for those who prefer electronic giving or can’t attend each week, have resulted in an “offering time” that is awkward and clumsy for worshippers and ushers alike. I’ve seen ushers who won’t let go of the plate, but walk about the sanctuary “collecting” from some people and not noticing others trying to get their attention because they want to give. Worshipers aren’t sure whether to pass the plate or not. 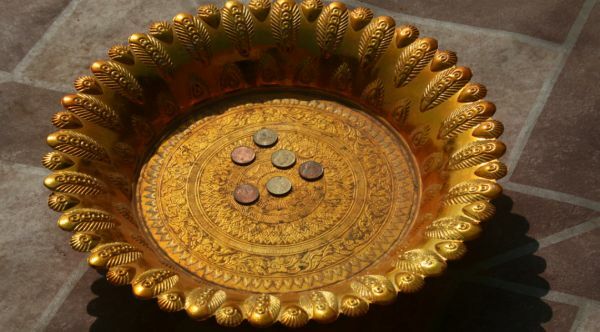 It looks and feels as if we are begging for people to “maybe” put something into the offering plate. Even at times when our churches are full, some people don’t have an opportunity to give because we lost the art of passing the plate long ago. Can we teach and allow everyone to see this time during worship as an opportunity to offer something – even ourselves — to God, regardless of whether they physically put something in the plate as it is passed? Simply touching the plate could be a reminder that we all have something to offer, even ourselves.